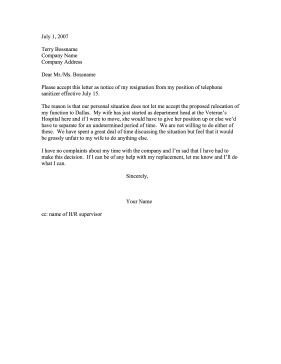 If you cannot relocate to a new branch due to a family employment situation, this resignation letter can be utilized. The reason is that our personal situation does not let me accept the proposed relocation of my function to Dallas. My wife has just started as department head at the Veteran's Hospital here and if I were to move, she would have to give her position up or else we'd have to separate for an undetermined period of time. We are not willing to do either of these. We have spent a great deal of time discussing the situation but feel that it would be grossly unfair to my wife to do anything else.